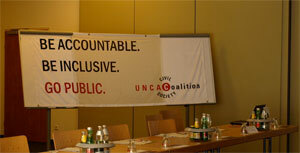 Governmental and UN representatives responsible for enforcement of the 2003 UN Convention against Corruption met in Vienna two months ago to discuss the process for reviewing implementation of anti-corruption measures. Below is an excerpt of a speech that Ifthekar Zaman, Executive Director of TI Bangladesh, gave. Like many other TI Chapters around the world we have also been engaged in strengthening the hands of our government to implement the UN Convention against Corruption and facilitate that the benefits of this unique Convention are reaped by the people. That my own country Bangladesh acceded to the Convention in February 2007 was the result of nearly 3 years’ campaign by TI-Bangladesh and our engagement with the Government. TI-Bangladesh worked closely with the Government in enactment of two very important laws, namely the Right to Information Act and Whistleblower Protection Act which are indispensable for implementation of UNCAC. We have been intensely engaged with the Government that the independence and effectiveness of the Anti-Corruption Commission of Bangladesh is ensured and sustained. That is why it is so important that this Convention is enforced and monitored, with civil society playing its rightful role. The review group overseeing implementation of the convention has taken an important step towards this by setting aside a full day for civil society. As my friend and colleague Cobus de Swardt, Managing Director of TI says, corruption is a crime against society, and therefore requires social solutions, which cannot be achieved without the participation of civil society. Two decades ago, when Transparency International was created, we could not have imagined that one day there would be a global arrangement in which experts from one country would visit another to make sure that commitment to fight corruption is met. When the Convention came into force very few of us also expected that we would also have a review process in which civil society will be so closely involved. We have come a long way indeed. Yet today, many countries have accepted country visits and inputs from civil society organisations, be it in my own country Bangladesh, as well as countries from Brazil to Burundi. And we are seeing more and more reports shared online. However, we have some causes for concern. Most notable among these is the issue of openness. At the end of the second year of the review process, less than 20 country executive summaries had been published online. And all of them are from the first year of review. We call on governments to find ways to expedite the process. Transparency International Bangladesh, and my colleagues in more than 90 countries around the world, still face barriers in trying to use UNCAC to make change. Either for lack of due appreciation of the benefits of UNCAC or for a deficit of political will, the true ownership of the Convention is yet to be developed in many cases. In many cases there are resource constraints, lack of knowledge, technical capacity and skills needed to make the Convention work. But, we also often observe that even when domestic legal regimes are compatible with standards and principles of the Convention, gaps in enforcement and practice persist, which can be addressed only by full commitment to build institutional capacity to truly and effectively criminalize corruption without fear or favour. There are even examples of institutions of accountability subjected to partisan political influence that make room for impunity to corrupt practices. Few countries are providing enough information about enforcement. Let’s say you are a member of the public, or the media. You want to know what your government is doing to prosecute corruption. In practice, you will struggle to find that out in too many countries. All 161 countries that have signed this ground-breaking treaty should honour their commitment to involve civil society in the process of reviewing whether they live by their treaty. That is part of the commitment they made when they signed up, a role that is enshrined in the Convention itself. The events of the Arab Spring as well as work of Transparency International around the world remind us that there can be no effective fight against corruption without citizen involvement, and that governments ignore civil society only at their own risk. No one can be oblivious of the fact that in the ultimate analysis power belongs to the people, and it is only by the mandate of the people that power is entrusted to the government. People have the right to know, and they have the right and responsibility to participate in matters of public interest.